Audio guide on board available in: Spanish, English, French, Italian, German, Chinese, Japanese, Portuguese, Russian, Dutch, Swedish, Norwegian, Turkish, Hebrew, Arabic and Catalan. 3 tourist tours with just 1 ticket, valid for 1 or 2 consecutive days*. * Ticket valid per calendar days and not for 24-hour periods. 5 transfer points to combine the 3 tourist tours around Barcelona. 44 bus stops at places of interest. 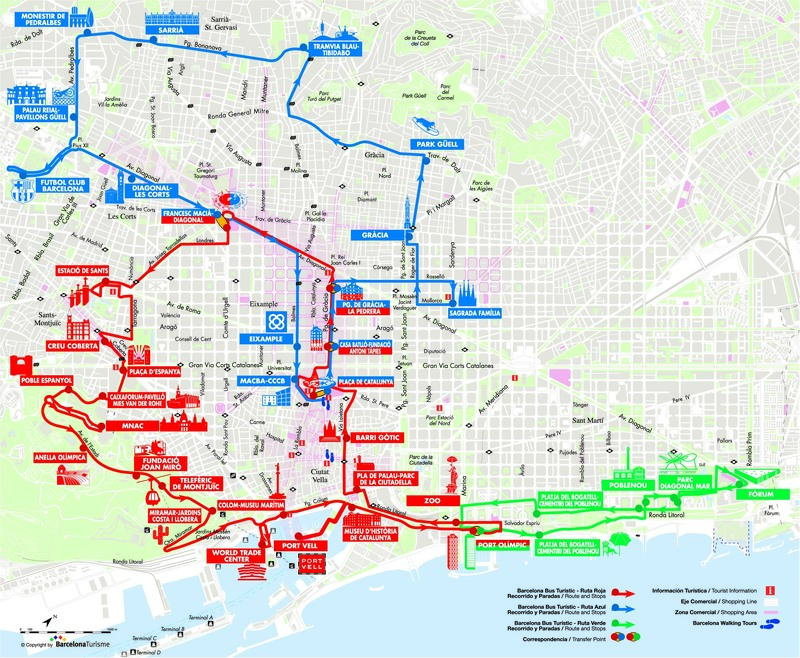 Barcelona Bus Turistic frequency every 5 to 25 minutes, according to the season. Check the routes and the stops here. Green route: Monday to Sunday, from 27/3 to 1/11. Special Promotion Barcelona Walking Tours: guided walking tours to discover Barcelona with a 50% discount! Exchange point: On board Barcelona Bus Turístic and Barcelona Turisme’s tourist information offices. IMPORTANT: The green route works from 18/03 to 06/11 in 2016.